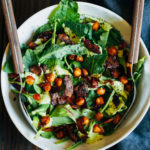 This is my favorite vegan salad, complete with spiced chickpeas, addicting coconut bacon, and a mouthwatering avocado dressing that's sure to be a crowd-pleaser. Start by making the coconut bacon. Recipe here. Once the coconut bacon is done, crank up the oven to 425 degrees F.
Rinse and drain chickpeas, then pat dry with a towel. In a bowl, combine all chickpea ingredients and mix until everything is evenly combined. On a baking sheet lined with parchment paper, bake chickpeas for about 25-30 minutes, or until slightly browned. In a blender, combine all dressing ingredients and blend until smooth and creamy. Add more water to thin if necessary. Fill your bowls with a layer of greens, then add on chickpeas and coconut bacon. Drizzle everything with the avocado dressing, and top it off with fresh cracked pepper.